This is a remarkable content of Resolution No.05/2018/NQ-HDTP providing guidelines for enforcement of Article 234 of the Criminal Code. - Any offence that is committed from 00:00 on January 01, 2018 and constitutes a crime shall face criminal prosecution as prescribed in Article 234 or 244 of the Criminal Code 2015 on a case-by-case basis. - Offences committed before January 01, 2018 shall not face criminal charges, except for the purpose of illegal trade or illegal earning. More details can be found in Resolution No.05/2018/NQ-HDTP which comes into force from December 01, 2018. Circular No.12/2018/TT-BTTTT promulgated by the Minister of Information and Communications on October 15, 2018 provides for maximum postage rate of universal postal services. - New postage rate shall not be determined based upon delivery mode such as surface mail or airmail. 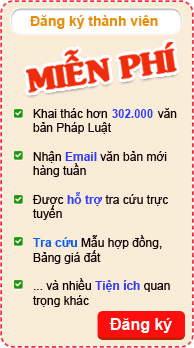 - Postage rates of mail delivery from Vietnam to other countries shall not be determined depending on continents or Asian-Pacific Postal Union (APPU) but based upon regions. - Weight standard for letter-post (including postcards) shall be domestically and internationally unified. Circular No.12/2018/TT-BTTTT comes into force from December 01, 2018. Circular No.03/2018/TT-BKHDT promulgated by the Ministry of Science and Investment provide for guidelines on issuance of forms for outbound investment procedure. - In case the investor is an individual: specify full name, nationality, date of birth, ID card number/passport number and issuance date and issuer thereof, permanent residence registration place, current residence, telephone number, fax number and email address (if any). Circular No.03/2018/TT-BKHDT comes into force from December 01, 2018 and will replace Circular No.09/2015/TT-BKHDT dated October 23, 2015. This is a content of Circular No.13/2018/TT-BTTTT providing for list of cyberinformation security products imported under license and procedures and application for issuance of license for import of cybeinformation security products. - Magnetic or optical readers, machines for transcribing data onto data media in coded form and machines for processing such data, not elsewhere specified or included. Circular No.13/2018/TT-BTTTT comes into force from December 01, 2018.